My family and I have been taking weekend excursions to photograph some of the lighthouses that dot the Maine coast. Our grand plan is to capture all of them but as of yet we have only managed to add three to our iPhoto collection. While the lighthouses are a fun intermediate goal our real focus is on quality family time and investigating and exploring more of this great state of ours. The first location we visited was Cape Neddick “Nubble” Lighthouse in York. It was an overcast day and the area was swarmed with tourists so getting a good picture was difficult. I would really like to return to this spot to capture an incoming storm or possible some dramatic cloud cover . . . maybe next visit. Kids and parents alike will also enjoy York Beach just a short distance away . . . just get there early during the summer! For more check out: http://www.nubblelight.com/. While visiting family in Ellsworth, we decided to drive down to Mt. 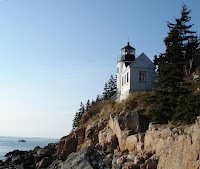 Desert Island one afternoon and check out Bass Harbor Light in Acadia National Park. The lighthouse is situated so that you will be required to navigate some fairly twisty stairs so watch your footing and pay careful attention to small children. At the bottom of the stairs, you will immediately see the standard photo options that line the postcard racks in Downtown Bar Harbor. We managed to capture a lobster boat cruising through the scene but still missed capturing any clouds or outstanding weather disturbances. Most recently we all traveled over to Rockland to checkout the Light House Museum and while in the area decided to go and see the Owl’s Head Light. As we drove over to Owl’s Head I began to get a little excited as I noticed dark storm clouds steadily building in the distance. I was hoping that I would finally get an interesting backdrop for my lighthouse shot! We arrived at the parking lot and started up the short walk to the lighthouse. The rains thankfully held off and we managed several shot opportunities. Including this favorite of mine. Any novice photographers who want to get out and take some great shots of lighthouses should spend a few minutes online googling or in the tourist shops looking over the racks of postcards. Weather and perfect lighting will always be beyond your control but this "research" should give you the background on how to properly frame the shot and even include some interesting elements. Great idea... Maine and lighthouses go together like wangs and cold beverages. I enjoyed your photographs... will look forward to seeing more of your work.